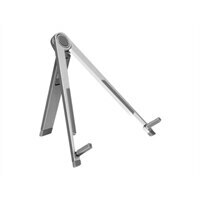 Aluratek Universal Tablet / iPad / eReader Stand - StandThe Universal Tablet/iPad/eReader Stand is the perfect accessory to your Tablet, iPad or eReader for watching movies, reading ebooks, playing games, viewing emails, or browsing the web. Its universal foldable design allows you to mount your device in landscape or portrait orientation. The stand's durable, light-weight design makes it the perfect travel companion. It's V-Frame design and non-slip rubber feet prevent sliding and provide a sturdy position on multiple surfaces. The Universal Tablet/iPad/eReader Stand is the perfect accessory to your Tablet, iPad or eReader for watching movies, reading ebooks, playing games, viewing emails, or browsing the web. Its universal foldable design allows you to mount your device in landscape or portrait orientation. The stand's durable, light-weight design makes it the perfect travel companion. It's V-Frame design and non-slip rubber feet prevent sliding and provide a sturdy position on multiple surfaces.